Here is a moment during the reenactment of the Battle of Lake Erie. Fifteen tall ships gathered near the Lake Erie Islands to go through the motions of that fateful battle in 1813. The American Navy was victorious. This was the first battle that the British Navy lost. All their ships were captured. 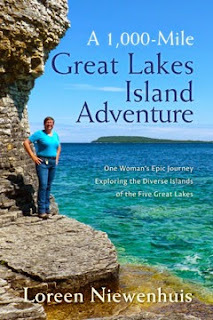 I was honored to be part of this reenactment and my account of that day -- along with the historic account from 1813 -- can be found in my third book, A 1,000-Mile Great Lakes Island Adventure.